Why do people park in handicap spaces when they're not supposed to? Oh, I see, they're handicapped alright - in the freakin' head! It's just plain heartless to do such a thing. Well... There it was, a shiny new white BMW (of course it was, what else did you expect???) parked smack dab in the middle of a handicapped spot right in front of Miki Japanese. I felt much disdain for the owner of the car. Well, I am a great believer in Karma... Somewhere down the line it will all equal out. Okay, enough of my ranting. So we are once again at a Japanese restaurant. Don't get me wrong, Viv and I lov e Japanese food. But, honestly, it has been a bit of an overkill lately. It's all due to my son's love of udon. I know we can make it at home; but every time we ask him what he wants to eat, it's those "thick noodles". Miki has been at this location for quite some time; but had to shut down for a little while as the building was being rebuilt. Now, in it's newer modern digs, it begs the question: has the food gotten any better? 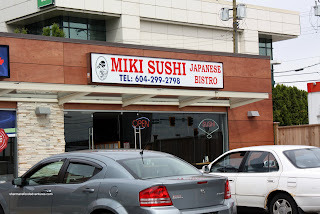 Yes, Miki is one of an endless sea of Japanese restaurants in the GVRD. No, it's not Japanese run (I think it's Vietnamese); however, let's not prejudge. We decided on Miki tonight since it's not too far of a drive from home. I was actually dreading the parking situation in the small plaza in which it resides. You see, Fatburger is a tenant too and the parking lot is generally pretty full during peak meal hours. Lucky for me, I did find a space which was NOT a handicap spot (I hope you are reading this Mr/Mrs. BMW!). Trying to order something a bit different than the usual, I chose the Hot Salmon Sashimi. To me, this meant sashimi which is probably seared and served warm. Of course, I was wrong and it turned out to be a spicy sashimi. I really think they should change the name of the dish. It was a bit spicy; but overall, it was a bit flavourless other than the oshinko bits. Furthermore, I really wish they didn't dice up the salmon into tiny cubes. We also got the Appetizer Sashimi which consisted of one piece each of Tai, Ika, Tako, Tuna, Hamachi and Hokkigai. Generally, the fish was pretty fresh except the piece of hamachi was a bit slimy. Although it was a good value at only $5.49. The Nigiri Sushi appeared to be a fantastic value on the menu, most items were only 99 cents including unagi. Some others were $1.49 and $1.99 respectively. We got one piece each of the tako, inari, hokkigai, chopped scallop, uni and 2 pieces of unagi. Again, everything seemed quite decent including the uni. I ordered it mainly for myself since Viv thinks it has an aftertaste of garbage. I have no clue what she's talking about! One thing that I didn't like was the rice. It wasn't mushy per se; yet it was on the softer side of the sushi rice texture continuum. At this point, I was still busy eating, attending to our son and taking pictures to notice much of anything else. Well, Viv eagerly points out to me that the boss lady had um... abnormally large "bakudanyakis". Huh??? WTH? Why does she always do that? Then I had to look and uh... In the words of Forrest Gump: "That's all I have to say about that". We got a couple of the specialty rolls which included the Rainbow Roll and the Dragon Roll. Both were actually quite decent and at 10 pieces each, they were a fabulous value. Of course we got an order of Tempura Udon for our son and the tempura itself was not bad. Light, crispy and not oily, we enjoyed eating it. However, the batter did seem a bit strange, it didn't resemble a tempura batter for some reason or another. As for the udon, it was plain terrible. The noodles were mushier than overcooked beef tongue. They fell apart on contact from a chopstick. Furthermore, the soup was weak and we couldn't understand the copious amount of Napa cabbage. In general, the food was on the good side of mediocrity. I know it doesn't sound like a ringing endorsement for the place. However, the food was alright, not great; but passable. Sure, the udon sucked and the sushi rice needs a bit of work; yet for the prices they charge, it fits the bill if you are nearby while not intending on eating authentic Japanese and are happy with mediocrity. i second your opinion on the handicapped parking. some people just assume they are entitled for whatever reason. i recently accidently parked in a handicapped spot (the sign was really little and covered by a tree) for about 2 minutes and realized it when i got back to the car. i STILL feed bad!! there were four other empty handicapped spots... but still. i can't imagine how people knowingly park in those. green tobiko on the rainbow roll? pretty! is that another variety or do they do something to it? I ordered out from that place for New Year's eve. We ordered almost 50 bucks worth. It was mostly terrible. The sashimi for us wasn't fresh. The tempura prawn in the dynamite and dragon rolls were cold, indicating they were not freshly fried. We were hoping it would be good because we like sushi and it was nearby. Too bad! Yes, they are vietnamese (weren't they always?). The rice is very soft. I usually tolerate softer rice, but this is more like chinese rice when it's on the "wet" side. Overall, we would never go back again. What a shame! Hi Trisah, yah, I've mistakenly done that before to and wonder how people can knowingly do that! I think they merely dye the tobiko for the colour. Kim, Jessica, let's just say I was already "kind" in this post. Yah, don't bother going there unless you want to see for yourself. Sorry, I know this was an older review...but I actually really like Miki, so i thought I would let it be known. I base my opinion on taste, value, and cleanliness. A lot of other places can't manage all three ;) Although Kita and Gohan are pretty good too. I've tried so many other places in Burnaby such as Akira, Gohan, Kita, Take, Yummy Yummy, Kilala, Little Tokyo, Toyo Tomi (thank goodness it's gone) and Makoto. I would love to know where else you'd suggest in this neighborhood. I'm a bit of a clean freak.